I thought it would be fun to write this in the style of a car review, instead of a straight movie review. So I guess it’s kind of a Cars 2 car review. I had the opportunity to test drive the latest Pixar roadster last week, which is always an occasion for celebration in my book. Over 11 model years, the engineers and designers at Pixar have consistently produced the highest quality vehicles of any manufacturer. I could gush uncontrollably for hours at a time about the sheer bliss I have felt behind the wheel of previous Pixar rides, whether it was the unrestrained power of a Toy Story 3 or Up, or the classic lines, uncompromising character, and industry-leading features of older models such as Finding Nemo or Monsters Inc. Pixar products are uniformly constructed to exacting standards using the highest grade materials, yet are always priced competitively; in fact, no model has ever exceeded the industry average in consumer cost. The simple fact is, year in and year out, nobody has come close to delivering the same level of value to their customers. Unfortunately, almost none of this applies to the newest steed to be released from the Pixar stables, Cars 2. The signature styling points are all there: sparkling design features, nifty handling and suspension, creative accessories and loads of unexpected extras, but once you get beyond the trim line, the vehicle loses its ability to command your attention. It’s not until you reach cruising speed before you begin to suspect something may be amiss. The engine seems to peter out, and you develop this sinking feeling that a head-on collision with disappointment may be waiting just around the next blind curve. You drive on, warily double-checking the features. The fit and finish, as usual with Pixar, is within tolerances not only for high-quality vehicles, but also for most nuclear physicists. Yet questions start to arise. Is the suspension system as good as you remember from other models, or is it just a tad soft? The handling seems to be in order, but is it really as supremely responsive as your memory says it should be? It takes a while, but you finally identify the source of your mounting concern: it’s the Cars 2 engine that’s letting you down. You’re moving smoothly at highway speed, keeping up with the other vehicles on the road, but what’s missing is the overdrive. When you want to kick it into high gear, when you want to plant your foot and leave everyone else eating your dust, it’s just not there. And that's when you realize, with disturbing impact, that this Pixar product is really just a very pretty commuter. If you’ve never driven a Pixar vehicle, the overdrive is its heart, and the primary source of what makes it special. At its best, the joy to be found in a well-executed overdrive is the pure joy of driving itself. It is the very reason we love to drive: to go somewhere new, to be taken there in a thrilling way, to experience a journey that affects us, and then to reach a destination that makes you feel great to be there, but just a little sad that the drive couldn’t have been a little longer. A well-designed overdrive creates a purpose, and as a driver, you respond with a willingness to share control with your ride because you can feel it knows where it wants to go and that it will take you there more surely than you could yourself. Pixar, more than any other manufacturer out there, understands the essence of driving, and has been delivering some of the highest quality overdrive artistry that the industry has seen in sixty years (we’ve missed you, Frank Capra, but we’re doing OK now). It, more than any other company, has been responsible for ushering in what, down the road, is likely to be known as a new Golden Age among vehicles in its class. So, to get in a Pixar vehicle with an overdrive as anemic as this one is admittedly a little shock to the soul. The gang's all here for Cars 2 - but is it enough? The designers over at Pixar insist that the power plant in Cars 2 is comparable to previous years’ models, and that no major changes have been made. A visual scan of the technical specs doesn’t reveal any substantial differences. However, speaking as someone who’s driven every vehicle in the line (as well as thousand of competitors’ models), the robustness of the overdrive in this model can’t hold a piston (or a Piston Cup) up to the others. 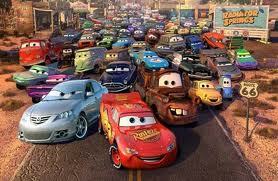 Cars 2 is like Nemo without Marlin, like Buzz without Woody, like Carl without Russell. Driving can be enlightening, inspirational, and yes I’ll say it, even spiritual. Or it can be dull, lifeless, and redundant. Unfortunately, Cars 2 falls short of the high end, even if it doesn’t sink to the depths of the low end. This is not to say that Cars 2 is a bad ride. It’s definitely not; but, aside from the skilled accoutrements, it is no different from the typical, middle-of-the-road family hauler that we’re used to seeing from other companies. 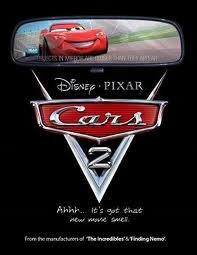 And that, because it’s Pixar, makes Cars 2 a bit of a lemon. Every manufacturer has a misfire at least now and again; just ask Toyota. The fact that Pixar has suffered one only means that they are being led and managed by human beings, and not ultra-evolved Prometheans from a far-distant future who are here secretly to smuggle us sparks of perfection, which is what I personally suspected. Unless, of course, Cars 2 was deliberately calculated to thwart exactly those suspicions. With Pixar, who really knows for sure? Bottom line: Stylish, but overall performance doesn’t rise above average.